This week was a large training step for the Seneca Battalion. We got our movement formations tuned up and experienced what it is like to do a Key Leader Engagement. The lab this week also included setting up a patrol base before moving out on the mission, which went better than ever before! Our training is paying off and we should be good to go for JLTX in no time! Thursdays lab was full of demonstrations and training! MS III and II cadets march back from showing MS I cadets basic battle drills. Members of Alpha 1-1 prepare to get into their ambush positions. 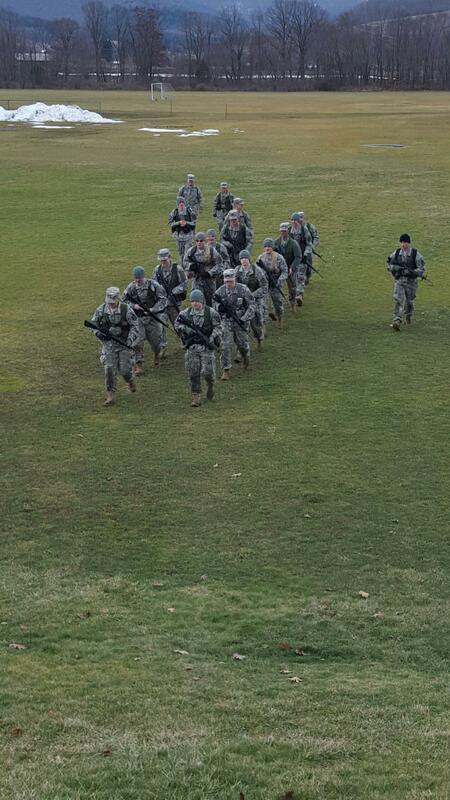 For the last week of lab for the Fall Semester, Seneca BN ROTC went out with a bang. Seneca BN conducted a platoon ambush in the vicinity of Bob’s woods on Thursday, utilizing every cadet present to form a full size platoon. The lessons from every lab were used in this final exercise, designed to test all cadets’ skills working in a tactical scenario. MS III cadets were put into leadership for the lab, making them revert to a training mentality instead of a teaching one. CDT Tampe briefs his plan to platoon leadership. CDT Jeff Tampe was assigned as Platoon Leader and was given a half hour to come up with a plan. After that he quickly assembled his platoon and headed in the direction of the ambush site. The platoon’s objective was to first reach Checkpoint One, which was to be the unit’s exfil point once the mission was complete. Once they’d reached the checkpoint the platoon moved in direction to flank the ambush site, eventually setting up an L-shaped ambush. Once the ambush was complete, Tampe moved his forces back to Checkpoint One without sustaining any casualties and completed the exercise. The point of this lab was a final test to see if the cadets had absorbed everything they had been taught over the course of the semester. CDT Furgal gives a basic block of instruction to a portion of the 6th grade visitors on how to use a compass and navigate with a map. Cadets from Seneca Battalion hosted middle school students from the Bolivar-Richburg school district on the Field Leader’s Reaction Course (FLRC) and in a land navigation exercise. Cadets took shifts instructing the 6th graders, putting them through blocks of instruction designed to increase their communication skills and provoke interest in outdoor activities. The event lasted from 9:30 a.m. to 1:30 p.m.
For the FLRC portion, the kids were run through three obstacles, the Wall, the Minefield, and the Broken Bridge. For the land navigation portion, the 6th graders received basic instruction before being guided to two land navigation points in the forest surrounding St. Bonaventure University by MS III cadets. The two groups of children learned valuable skills but more importantly got a chance to get out of school and experience the outdoors. It was also a chance to see some of what Army ROTC had to offer. CDT Bradley Crow cuts the cake after dinner is completed. Seneca Battalion Cadre pose for a picture. The Seneca Battalion MS II class poses for a picture. The Seneca Battalion MS IV class poses for a picture. The head table chuckles after one of Mr. Vice’s jokes. CDT Feurch adds protein powder to the Grog. CDT Russel explains why he is about to add salt to the Grog. Horrified onlookers watch the MS IV’s add various disgusting ingredients to the Grog. CDT Stienbroner recites the Soldier’s Creed during the opening ceremony. The Colorguard posts the colors during the opening ceremony. Cadets enjoy social hour before the event begins. The MIA/POW table, present at every Army formal event. Seneca Battalion Cadre all drink from the Grog during Dining In 2015. Every year towards the end of the fall semester, Seneca Battalion holds a formal dinner on a Friday night geared towards celebrating Army Tradition and enjoying the camaraderie between soldiers. Known as Dining In, this tradition dates back to the first days of the Army. Members attending the mess must abide by a certain set of rules, overseen by Mr. Vice, an MSIV. Cadre members as well as cadets in Battalion leadership sit at the head table and each class sits together. Once the mess was declared open, the punch bowl ceremony was conducted by MS I cadets. A different cadet added each ingredient to the punch, giving a short speech as to the significance of that ingredient. Every person in the mess got to taste the punch before the MS IV’s added their contributions – anything edible, with a reasonable explanation, was allowed to be mixed into the punch to create a concoction so foul that the serving staff would not venture near it. This sludge is known as the Grog, and it is possibly the foulest liquid that one will drink in the Army. The rules of the mess are printed and placed on every table in the mess; once the mess is declared open, the rules are all-encompassing. Mr. Vice is solely responsible for ensuring all order and discipline are maintained. If these rules are broken, Mr Vice will decide the punishment – which is drinking a canteen cup full of the Grog. After the Grog is made, dinner is served, during which all proper decorum must also be maintained. After Dinner and deserts, the skits are presented. Seneca Battalion has put its own spin on the tradition and has every MS class make a skit to present to the rest of the mess. In recent years these skits have turned into videos for which the rules are simple; members of the Battalion may only make fun of those higher than themselves. For example, MS I cadets can make fun of MS II, MS III, MS IV cadets and cadre. These skits are a source of hilarity and very important boost in morale that are often talked about for the rest of the semester. The night lasted roughly four hours and was closed as it had begun. Many cadets left laughing at the skits they had witnessed, enjoying their fellow cadets’ interpretations of themselves. With the final major event of the semester now complete, cadets will focus on their studies, preparing for final exams and the holidays. A full set of pictures from Dining In 2015 can be found on this blog. 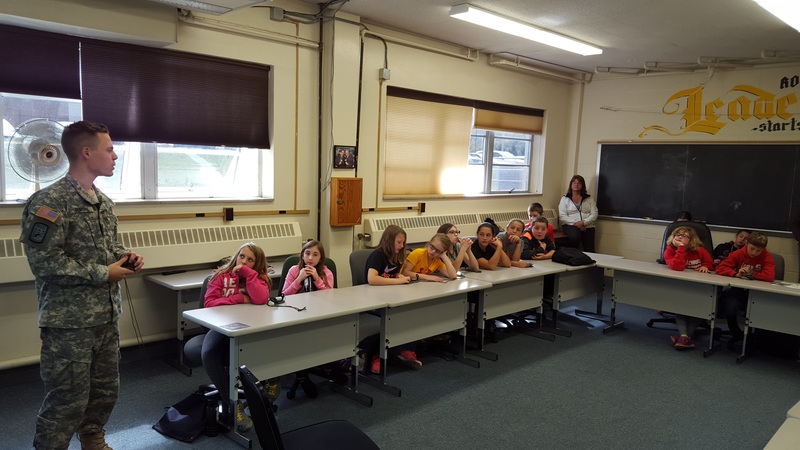 This week Seneca Battalion took a break from the battle drills and focused on classroom instruction. Splitting into three different sections the battalion spent time learning how to program and send radio transmisions on the PRC-119 radio, learned proper radio etiquette and practiced calling in MEDEVAC support, and learned cold weather survival techniques. Cadets took turns assembling and programming the radios, then sending 9-line MEDEVAC requests to a MS III cadet in another location to simulate actually calling for a MEDEVAC in the real world. Once cadets completed the radio portion they moved onto the cold weather portion, which was classroom session that taught the basics of survival and preparation in the cold weather. Seneca Battalion looks forward to Dining In, a formal dinner in which the Battalion celebrates Army traditions and enjoys skits put on by each MS class. CDT Farley provides flank security while other cadets move into position for an ambush. 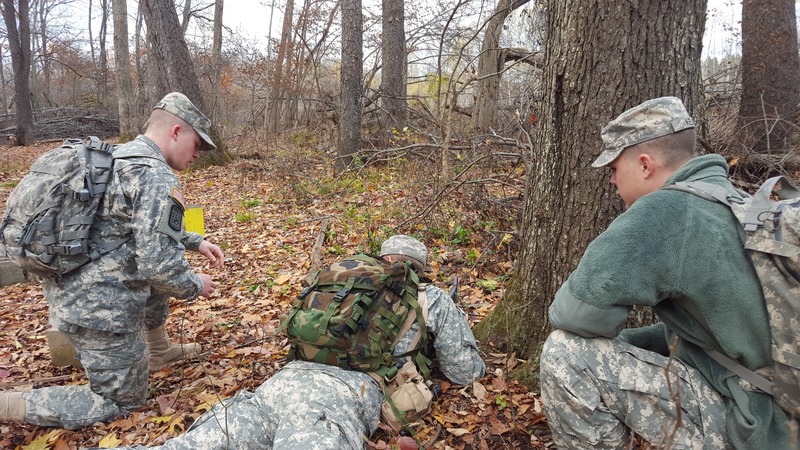 Seneca Battalion took to the woods this week to practice the art of the ambush. There are several types of ambushes applicable to the myriad of tactical situations that a platoon can find itself in; the three taught at the lab were linear, L-shaped, and V-shaped ambushes. All three are primarily focused on attacking roads that enemy forces use as high-speed avenues of approach and egress on the battlefield. The linear ambush is a single formation of soldiers parallel with the road; it is the fastest and simplest type of ambush to set up. Often it is used along a long, straight road where there is a ditch or some other form of cover that allows the unit to hide nearby. An L Shaped ambush is used at a sharp bend in the road, where the unit can open fire and assault from two different angles. A V-shaped ambush is used when there is no cover next to the road and soldiers have to lay in concealment farther out, firing from a greater range at an angle which prevents friendly fire. A diagram displaying a platoon linear ambush. While there are many different formations for an ambush, the concept is the same. The intent of an ambush, whether it is executed at the squad or platoon level, is to catch the enemy off guard and destroy them as quickly as possible. Once the unit is at the Objective Rally Point, or ORP, the squad or platoon leader will move out with a small security detachment and execute a leader’s recon on the ambush area, deciding the type of ambush that the unit will perform. The leader will place security on the flanks and bring the rest of the unit up, placing them evenly between the flank security teams to focus fire on a particular point, the kill zone. Once the soldiers are in place the leader will set up a mass-casualty producing weapon, such as a Claymore anti-personnel mine, M-240B machine gun or AT-4 rocket launcher. Once the enemy has entered the kill zone the leader will initiate the ambush with that mass-casualty producing weapon and start what is known as the “mad minute” – where the entire unit opens fire on the enemy in the kill zone for several seconds until they are all down. Then the unit will move onto the road and quickly secure the area, collect enemy weapons and intelligence, call up to higher command, and destroy the enemy weapons in place as they move off of the objective. 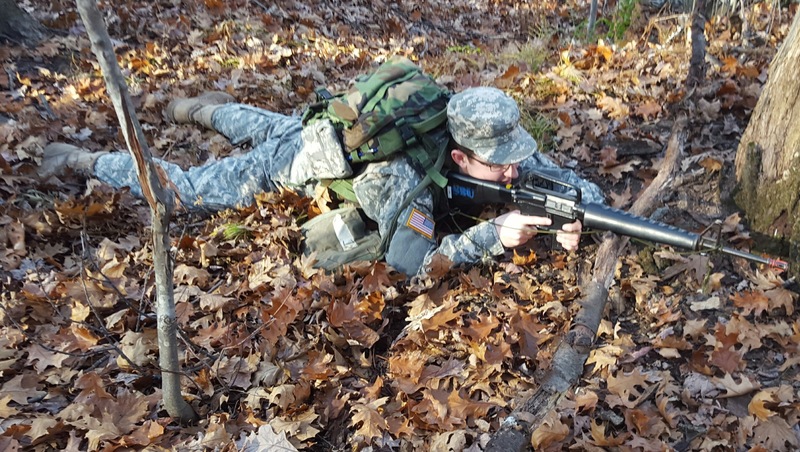 Seneca Battalion broke into squads and practiced executing these ambushes in the woods behind St. Bonaventure, using MS II cadets as squad leaders in an effort to prepare them to be leaders for the next two years as well as to prepare them to lead their own tactical lanes at Leadership Training Exercises in the future. CDT’s Sourbeer and Kelly describe the proper recon procedure to a MSII cadet while he lays in security during the Recon lab. Reconnaissance is one of the most important tools that a commander has while planning an operation. Whether on the battlefield or in garrison, knowing the area of operations before a mission is set to commence can mean the difference between victory and defeat. The leader’s recon is a mainstay of US Army squad and platoon level tactics, done in the hours or even minutes before an attack, whereas a route, zone, or area recon is a tasking in and of itself for a squad or platoon on the ground in a combat zone. Seneca Battalion cadets learned the route/zone/area recon techniques this past week, first in a classroom session and then in a training exercise in the woods. While all of them experienced a recon lane at the Battalion’s LTX, many of the younger MSI and II cadets stayed in security while MS III cadets performed the actual recon. This lab was meant to correct that and show the younger cadets the methods of how to conduct the recon once they’ve left the security of the rest of their squad. The Battalion split into three squads, all laying in security while taking turns going out on the recon. The two squads that remained received supplemental training covering a wide variety of topics. As each squad came back their turn they reported their findings to a MSIV. Once all of the squads came back the cadets performed an After Action Review and were dismissed.